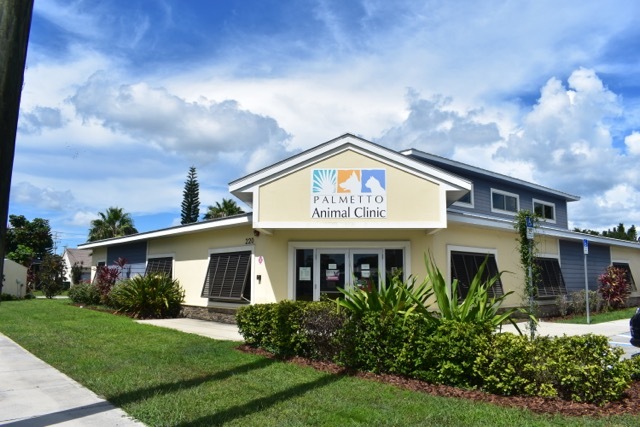 Palmetto Animal Clinic, located in Palmetto, FL, is a full service companion animal hospital serving the areas of Palmetto, Ellenton, Parrish, Duette, and Bradenton. It's our commitment to provide quality veterinary care throughout the life of your pet. Our services and facilities are designed to assist in routine preventive care for young, healthy pets; early detection and treatment of disease as your pet ages; and complete medical and surgical care as necessary during his or her lifetime. We also offer boarding through Opie's Doghouse! Our veterinarians and veterinary staff have been helping animals and their families from the communities of Manatee County Florida for over 30 years. Click here to read more about our caring team! A note regarding The Veterinary Care Foundation (VCF): Every year Palmetto Animal Clinic provides thousands of dollars of free care to treat pets brought to us by Good Samaritans. From time to time clients will drop off donations as a way of saying thank you for the loving care that we have provided. Unfortunately, until now those gifts have not been tax deductible. The VCF is unique in that 100% of every dollar donated goes directly to veterinary practices - VCF's operating costs are totally covered by practice membership dues. Palmetto Animal Clinic has joined with VCF, please visit their website to learn more about how you can help. Please contact us at (941)722-2456 for all your pet health care needs.